Truly - the alarm with everything! 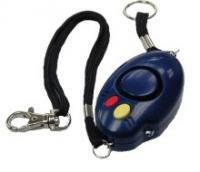 Handbag Attachment to use as handbag alarm. 2 x AAA batteries pre-fitted. Replacement batteries are readily available at most high street electrical retailers. Logo Branding Service available on this product. The ‘Genny’ is designed for women and can go everywhere with you. Closer than a friend, this All Purpose Personal Attack Alarm masquerades as a car key fob. The double attachment also allows you to attach your bag or purse to yourself via the belt clip and if snatched, the alarm is activated. The attacker, now drawing attention, is likely to drop it and run leaving you and your bag safe thus making it suitable for even the most reluctant personal alarm user. (Oval Shape) Length 7.0 cm, Width (At widest Point) 4.0 cm, Height only 2.2 cm. Activated by pulling the keyring/rip-cord, to pull out the pin. To de-activate, simply replace the pin. This Personal Safety Alarm is designed to increase your personal safety by being convenient and accessible whenever you require. The design of this alarm also allows it to be used as a handbag/purse alarm. Connect the clip to the handbag or purse and then attach the belt clip to yourself, then if anyone grabs your bag, it will trigger the 130dB siren immediately. Alternatively, you could attach the alarm itself to your bag and then use the clip to connect to your belt loop. Now if the bag is snatched, not only will it trigger the alarm but the alarm will still be attached to the bag and as the thief trys to run off, the alarm will be going with him!